The Vision X 6" square XIL-OEA9706TJOP1 features 10 watt LED Technology, narrow beam pattern offers you an even tighter beam pattern for great distance, and black aluminum housing. The XIL-OEA9706TJOP1 comes with a standard warranty on the hardware and extended on the lights, and multi-volt 9-48V DC input. 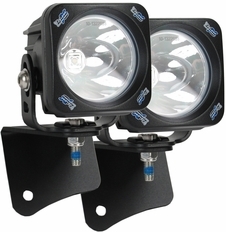 Offers a bolt on direct to factory mounting and gives you triple the light output of factory.